A fruit and cheese appetizer recipe that’ll get any palate primed for the main course. A brilliant combination of savory, sweet and crispy that’s low-fat and ready in under 15 minutes. DIRECTIONS1) Lay crackers on flat surface. Spread cream cheese on crackers. Add turkey slices and dollop with fruit preserves. 2) Garnish with fresh thyme leaves, if desired. This product is fully cooked and is “Ready To Eat”. Mesquite smoked flavor meets the sweet taste of honey. JENNIE-O® Hickory Smoked Honey Turkey Breast is deli turkey amped with flavor, and good for more than a sandwich. Use it for nutritious protein or as a main ingredient in appetizers or as a main ingredient in your next salad. Look for it in the deli section of your grocery store. It’s a classic for a reason. Chop up a bell pepper, grab some JENNIE-O® Tender Browned Turkey Breast straight from the deli and serve up an astoundingly lean lunch in under 15 minutes! 1) In skillet, saute pepper strips and green onions in olive oil. Spread bread with herbed cream cheese. Top with turkey. Arrange vegetable mixture on turkey. Had a light Breakfast to start the day. I toasted a Jennie – O Whole Grain English Muffin that I topped with Smucker’s Sugar Free Blackberry Jam. Also had the morning cup of Bigelow Decaf Green Tea. Started a load of laundry and headed out Kroger for a few items for my Mom and myself. On the way back stopped by the bank and got gas. Outside it’s been a cloudy day and a high around 37 degrees. Not much else going on so I ran a couple of scans on my computer. Then kicked back the rest of the day. For Dinner tonight, it’s Pizza Night! I prepared a Turkey Sausage, Turkey Pepperoni, Mushroom, and Olive Pizza, on a Whole Grain Pizza Crust. To make my Pizza I’m using Mama Mary’s 12” Whole Grain Pizza Crust. There’s 150 calories and 27 net carbs per serving. Then for my Toppings and Sauce I’m using; Hormel Turkey Pepperoni, Jennie – O Turkey Ground Sausage, Sliced Mushrooms, Sliced Black Olives, Sliced Green Olives, Sargento Shredded Mozzarella Cheese, and Ragu Original Pizza Sauce. To prepare my Pizza; I first preheated my oven to 450 degrees. I then got a medium size skillet, sprayed it with Pam Cooking Spray and heated it on medium heat. Next I got the roll of Jennie – O Turkey Sausage out and sliced about 1/4 of the roll off. I put the remainder in a plastic bag and put it back in the fridge to use later for a meal. I crumbled the Sausage and fried until done. Removed it from the skillet onto a paper towel lined plate and set aside. I removed the pizza crust from package. Lightly brushed crust with Extra Light Olive Oil. I then gathered my toppings up. The Black Olives are already sliced but the Green Olives come whole and I had to slice them. I then topped the crust with with; the Ragu Pizza Sauce, the Sargento Mozzarella Cheese, Hormel Turkey Pepperoni, Jennie – O Turkey Sausage, and finally the Black and Green Olives. The order of layers is all up to you. Next I lowered the oven temperature to 425 degrees F. Then baked on oven Pizza Pan (middle position) for about 10 minutes. You can turn the oven on broil if you want to get the crust crisper if you want. I stopped at 10 minutes and it came out perfect! The Crust baked up with a nice crunch to it and all the ingredients worked great together. I love adding Olives to any dish I can. For Dessert tonight a Weight Watcher’s Cookies and Cream Ice Cream Bar. * Mama Mary’s Pizza Crusts Whole Grain – 2 CT.
* Bakes in about 10 Minutes! * Per serving: 150 Calories. * 0.5g sat fat, 3% DV. * 360mg sodium, 15% DV. Refrigerate or freeze after opening. Preheat oven to 450 degrees F. Remove pizza crust from package. 1. Lightly brush crust with olive oil. 2. Top crust with desired ingredients. 3. Lower oven temperature to 425 degrees F. Bake on oven rack or cookie sheet (middle position) for 7‑1/2 to 10 min. Hint: For a more crisper crust, broil until desired appearance is achieved. whole wheat flour, water, soybean oil, contains 2% or less of each of the following: yeast, sugar, dried honey solids, leavening (sodium aluminum phosphate, baking soda), salt, dough conditioners (enzymes), fumaric acid, calcium propionate. It was a couple of Egg’s and a cup of Bigelow Decaf Green Tea to start my day, I love those Eggo’s! I use the Nutri-Grain Low Fat Eggo. After Breakfast I headed to Meijer and to Kroger. I wanted to have everything done early as it’s going to be a hot and humid day out, 95 degrees and high humidity. Plus an extremely bad day for allergies, another high Pollen and Mold day out there. My allergies have never been as bad as they for the past week or so. So after returning home i stayed in for the rest of the day. Caught up on things around the house. For dinner tonight a very easy meal to prepare and a very good meal also. I prepared Jimmy Dean Delights Smoked Ham Sandwich w/ Amy’s Creamy Tomato Soup. It was dinner through the wonder of microwave tonight, Jimmy Dean Delights Smoked Ham Sandwich. It comes frozen with two slider size sandwiches. They have 2 different ones but my favorite is the Smoked Ham Sandwich. It’s 2 Ham Sandwiches with Sharp Cheddar Cheese on a Pretzel Roll. It comes in a microwavable steam package. Just heat for 75 seconds and serve! The Ham, Bun, and Cheese all tasted great and they were only 290 calories for both Sandwiches. These are great to have in the freezer! Then I also heated up some Amy’s Organic Creamy Tomato Soup. My favorite Tomato Soup by far. I’ve been using this a few years now. So creamy with a fantastic flavor and it’s 110 calories and 19 carbs. I also had an ice-cold Diet Dr. Pepper, that I sat in the freezer for 15 minutes to chill, to drink. For dessert later a Healthy Choice Dark Fudge Swirl Frozen Yogurt. 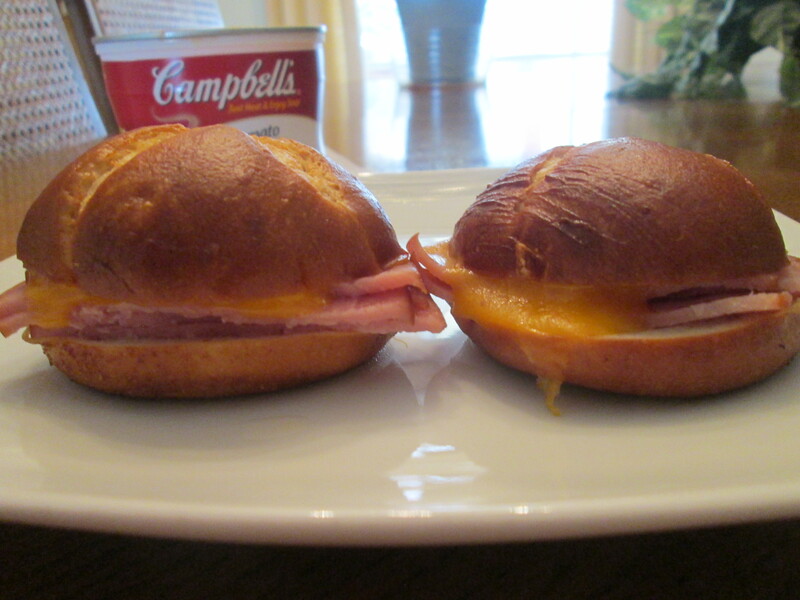 Enjoy two ham and cheese sandwiches on pretzel buns for 290 calories. Because two hams are better than one. Always follow heating instructions. Keep frozen until ready to use. Due to differences in microwave ovens, heating times may vary. Remove sandwiches from carton. DO NOT REMOVE FROM POUCH! Place Sandwiches in pouch, flat side (white side) down near edge of microwave turntable. Microwave on HIGH as follows: If you don’t know the wattage of your microwave start with 1100 watts and add time if needed. Heating time: 1100 watts: 65-75 seconds; 700 watts: 1 minute 50 seconds 2 minutes. To heat one sandwich: Remove sandwich from pouch and wrap in a paper towel. Microwave on HIGH for 35 to 40 seconds or until hot. For this week’s Sunday Pizza a Memphis Style BBQ Turkey Pizza. It’s from the Jennie – O website (https://www.jennieo.com/) It uses the JENNIE-O® Turkey Breast Roast along with toppings of; Broccoli Slaw, Coleslaw Dressing, BBQ Sauce, and served on a Whole Wheat Pizza Crust. 1 – Heat oven to 450°F. In medium bowl, mix broccoli slaw and coleslaw dressing; set aside. 2 – Spread ¼ cup barbecue sauce over pizza crust. In large bowl, combine turkey with 1 cup barbecue sauce. Spread barbecued turkey over pizza crust. Bake 10 minutes or just until heated through. 3 – Spread remaining barbecue sauce over the turkey. Top turkey with broccoli slaw. It was one foggy morning out there this morning. I looked out the window and I could see no further than our next door neighbor. They said parts of our area was so bad they shut down roads until it cleared. Only about 36 degrees out also this morning. Well it’s the second day in a row I’ve had to go to a Doctor. This time it was to remove a cyst like knot on my left hand index finger knuckle. He couldn’t do the surgery in his office so I’m waiting for an open date at the hospital to get it done. Nothing serious though not cancerous, ans that’s a very good thing!. For dinner tonight it’s Sandwich and Soup, Jimmy Dean Delights Hickory Smoked Turkey Breast Sandwich w/ Amy’s Cream of Tomato Soup. Just one of those nights where I didn’t feel like putting a lot of effort in cooking. So I hit the freezer for my meal tonight. First I prepared, microwaved, Jimmy Dean Delights Hickory Smoked Turkey Breast Sandwich. Easily prepared and delicious, plus it’s only 290 calories and 31 net carbs for 2 mini sandwiches. Just remove it from the box and lay the package in the microwave and heat 1 minute and 15 seconds, done! Topping the Hickory Smoked Turkey Breast is Applewood Smoked Bacon and Sharp Cheddar Cheese on a Honey Wheat Bun. Not only does it sound good, it tastes even better! Jimmy Dean has another winner of a Sandwich along with the Smoked Ham Sandwich. The Bun stayed nice and fresh and all the ingredients worked perfectly and made one delicious sandwich. These are great items to have in your freezer. Then I also heated up some Amy’s Organic Cream of Tomato Soup. My favorite Tomato Soup by far. I’ve been using this a couple of years now. Creamy with a fantastic flavor and it’s 110 calories and 19 carbs. I also had a Diet Dr. Pepper to drink. For dessert later a Jello Sugar Free dark Chocolate Mousse. A delicious hickory smoked turkey and applewood smoked bacon sandwich makes a stomach happy. Getting two for 290 calories will make you feel over the moon. Busy day today. Started off with some Eckrich Smoked Turkey Sausage Links, 1 Egg Sunnyside Up, (Klosterman)Wheat Toast, and Bigelow Decaf Green Tea. Got in my early morning workout and outside for some clean up. It seems if there is a leaf or wrapper blowing around it lands here at the house, got the leaf blower out and cleaned up. Then I had to call Dad’s Family Doctor and get the ball rolling on getting Mom some help taking care of Dad. Mom’s 87 herself and Dad’s to the point where he can very little and it’s wearing Mom out trying to take care of him. I do what I can but somewhat limited being in a wheelchair. So they are going to get a care worker to come in 3 days a week and help Mom out, this is going to help her so much! So for dinner tonight an easy to prepare meal! 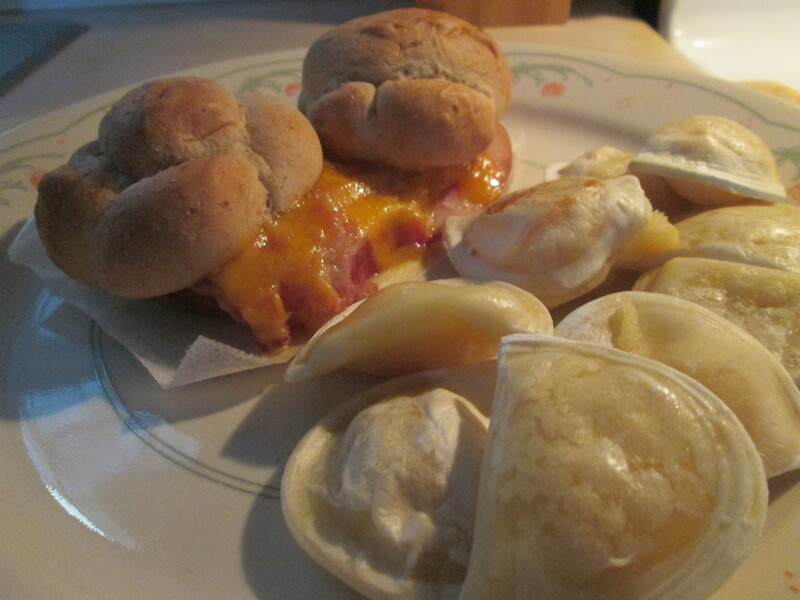 I prepared Jimmy Dean Delights Hickory Smoked Turkey Breast Sandwich w/ Mini Four Cheese Medley Pierogies. 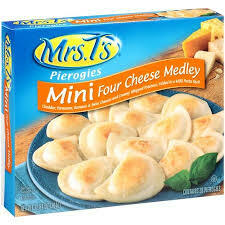 Then for a side I prepared a box of Mrs. T’s Mini Four Cheese Medley Pierogies. Love these things, but also an item I just don’t have a lot. 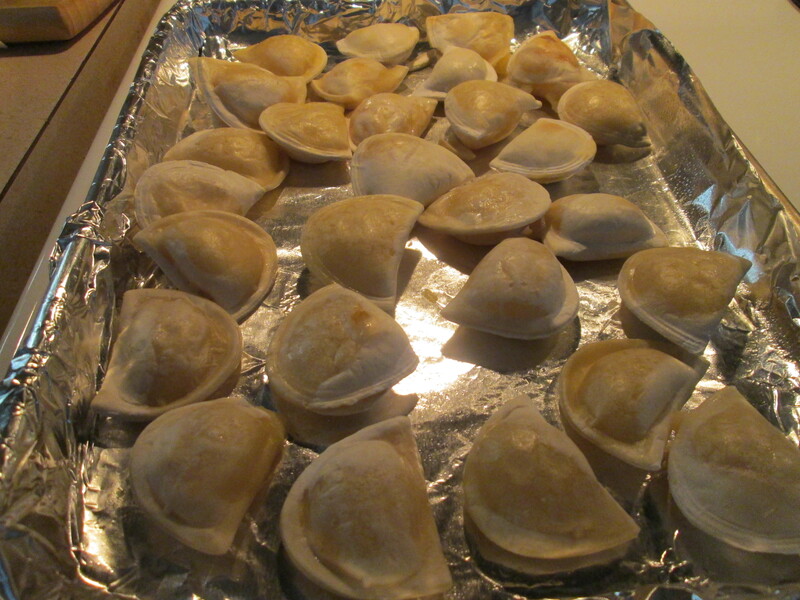 I tried another brand of Pierogies but they couldn’t come close to the Mrs. T’s Brand! To prepare them; bake at 400 degrees for 17 minutes, turning halfway through the baking time. Easily prepared and delicious! Nice even balance of Potatoes and Cheese in a Pastry Shell. If you’ve never had them, they’re like a stuffed dumpling. Tonight was a very easy to prepare meal and at the same time delicious! For dessert later a bowl of Del Monte Sugar Free Sliced Peaches. Mrs. T’s Mini Four Cheese Medley Pierogies are bursting with the flavor you love. Mrs. T’s believes times spent with your favorite people are the best of times. Filling these moments with foods you love makes them even more delicious. Whether you’re getting together for small bites or a casual meal, Mrs. T’s pierogies are always best when shared. Woke up to about 2″ of snow, not much at all but the temperature dropped to the low teens with a wind chill of around 8 degrees. So after it snowed the wind froze everything, which is making some slick roads out there today.Plenty of sunshine but not doing a lot of good. Warmer temperatures on the way for the weekend though! Shoveled what snow and ice I could and cleaned off the cars of the blowing snow and inside for the day. Basically did a whole lot of nothing today. 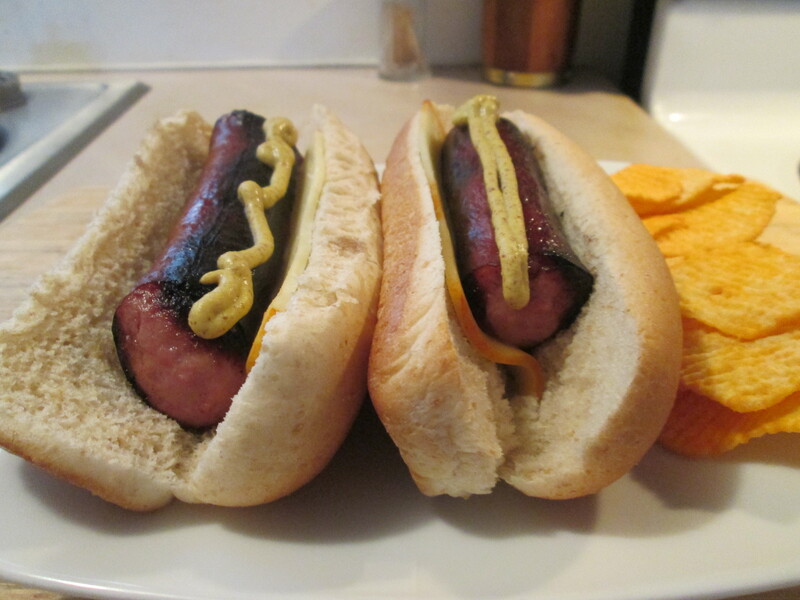 For dinner tonight it’s Smoked Turkey Sausage and Muenster Cheese Dogs w/ Baked Ruffles Chips. I had some leftover Butterball Hardwood Smoked Turkey Sausage from when I made the Jambalaya so I used that for my dinner tonight. Cut the remaining Sausage into to 2 pieces to give me a couple of Sausage Dogs. I absolutely love the Butterball Hardwood Smoked Turkey Sausage. It’s got such a fantastic flavor and always cooks up just right. To prepare them I used a large skillet, added about a tablespoon of Extra Virgin Olive Oil and preheated it on medium heat. Put the Sausage in the skillet when it was heated up and covered with a lid. I turned the Sausage every few minutes to get an even char on them, cooked about 11 minutes total. As always they came out bursting with flavor and just flat-out delicious! For the Buns I used Aunt Millie’s Reduced Calorie Whole Grain Buns. Before putting them on the Buns I had added a Half a Slice of Simple Truth Muenster Cheese. I then topped the Sausage with French’s Spicy Brown Mustard, love these things! 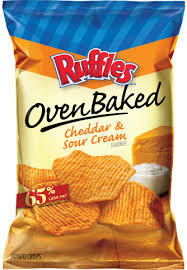 To go with the Sausage Dogs I had some Ruffles Oven Baked Cheddar and Sour Cream Chips. It had been a while since I had any of these, a very good Chip! Their 120 calories, 20 net carbs, and 3.5 g fat per serving (13 chips). For dessert later tonight a Healthy Choice Frozen Greek Yogurt. We had a very light dusting of snow this morning, 31 degrees but very windy. We might be in line for around 5-7 inches of snow Sunday but it could be very little or even rain, too close to call yet! It was household chores today. Ran the sweeper, dusted, and did a load of laundry for Mom. Still been snacking on this year’s crop of Honey Crisp Apples! I think this year’s crop is one of the best I’ve ever had. Huge Apples and sweet as can be. I’ve been through countless of them the past few months! For dinner tonight I prepared a Jimmy Dean Delights Hickory Smoked Turkey Breast Sandwich w/ Roasted Buffalo Cauliflower. Jimmy Dean Delights Hickory Smoked Turkey Breast Sandwich, my dinner tonight. Easily prepared and delicious, plus it’s only 290 calories and 31 net carbs for 2 mini sandwiches. Topping the Hickory Smoked Turkey Breast is Applewood Smoked Bacon and Sharp Cheddar Cheese on a Honey Wheat Bun. Not only does it sound good, it tastes even better! Jimmy Dean has another winner of a Sandwich along with the Smoked Ham Sandwich. The Bun stayed nice and fresh and all the ingredients worked perfectly and made one delicious sandwich. These are great items to have in your freezer. For a side dish I made Buffalo Roasted Cauliflower. 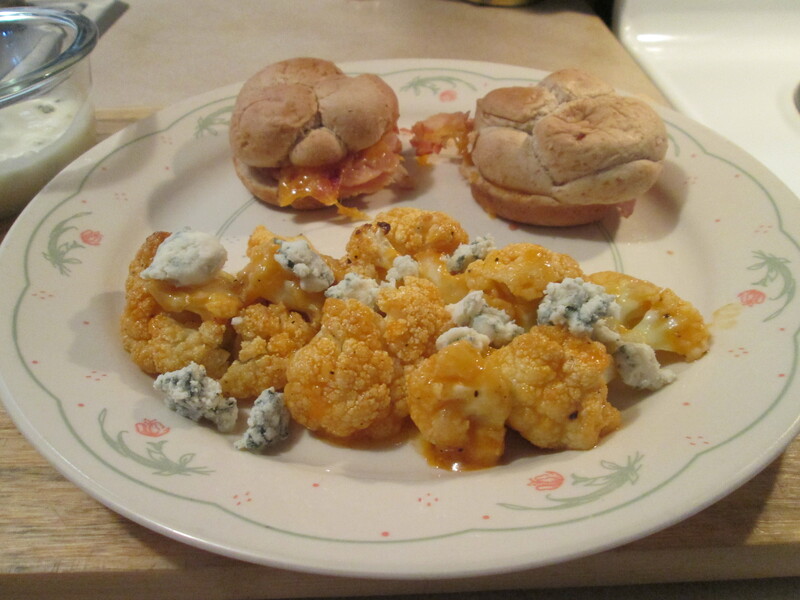 To prepare it I needed; 1 container of Cauliflower Florets, 1 tablespoon of Extra Virgin Olive Oil, Sea Salt and Pepper to taste, 1/4 cup or more) Frank’s Hot Sauce, and Litehouse Light Blue Cheese Dressing for dipping. 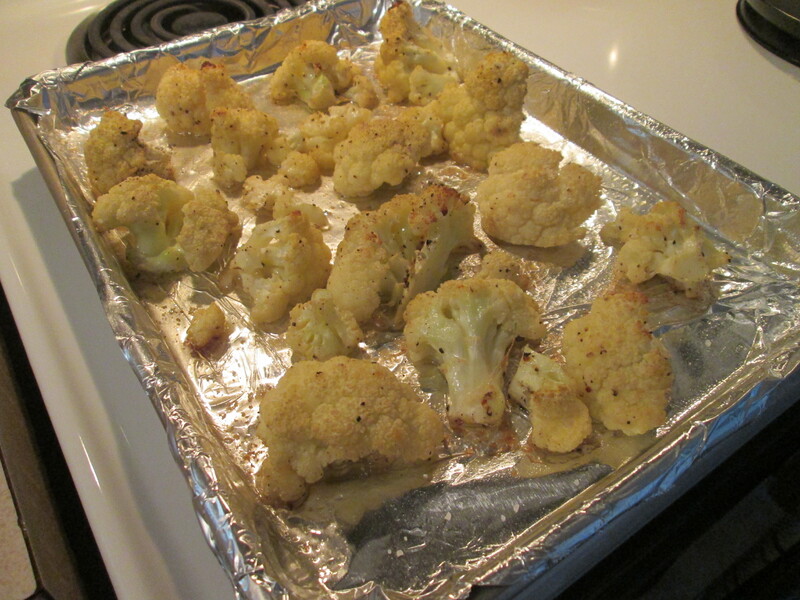 Then to make it is really easy I just tossed the Cauliflower Florets in the oil, salt and pepper, arranged in a single layer on a baking sheet and roasted in a preheated 400F oven until lightly golden brown, about 20-30 minutes. 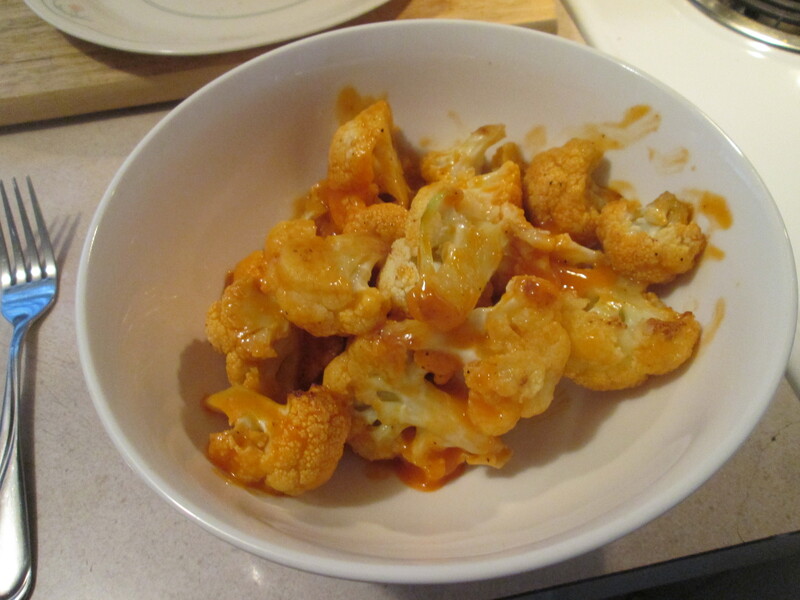 Then, the good part, toss the cauliflower in the Frank’s Hot Sauce. Served it with Litehouse Light Blue Cheese Dressing/Dip for dipping. It’s one delicious side dish, if you love Chicken Wings you’ll love this! The full recipe is below. 1/4 cup Frank’s Hot Sauce or more! 1 -Toss the Cauliflower Florets in the Extra Virgin Olive Oil, Sea Salt and Ground Pepper, arrange in a single layer on a baking sheet and roast in a preheated 400F oven until lightly golden brown, about 20-30 minutes. 2 – Toss the Cauliflower in the Frank’s Hot Sauce. Have the Litehouse Blue Cheese or Ranch Dressing for dipping, you could have celery sticks on the side. A little rain overnight, but it was in the 40’s this morning. Partly cloudy afternoon but it was in the 50’s, so not bad. Cooler weather with rain moving in though for next week. Went to kroger early for some Bread and Milk and back home for the day. Sat back and watched the NFL Football all afternoon. For dinner tonight it’s Jimmy Dean Delights Smoked Ham Sandwich w/ Campbell’s Creamy Tomato Soup. It was a microwave dinner tonight! I tried the new Jimmy Dean Delights Smoked Ham Sandwich a while back and became an instant fan of them. It comes frozen with two slider size sandwiches. They have 2 or 3 different ones but I’m going with the Smoked Ham Sandwich tonight. It’s 2 Ham Sandwiches with Sharp Cheddar Cheese on a Pretzel Roll. It comes in a microwavable steam package. Just heat for 75 seconds and serve! The Ham, Pretzel Bun, and Cheese all tasted great and is only 290 calories for both Sandwiches. It’s definitely a good one to have in your freezer. Then to go with Ham and Cheese I made some Campbell’s Creamy Tomato Soup. Another microwave product, just heat for 1 minute and 30 seconds and serve. Raised on Campbell’s Soup and still love the products. So for 2 minutes and 45 seconds of microwave I had my dinner, plus no cleanup! For dessert later a Healthy Choice Dark Fudge Swirl Frozen Greek Yogurt. Microwave on HIGH as follows: If you don’t know the wattage of your microwave start with 1100 watts and add time if needed. Heating time: 1100 watts: 65-75 seconds; 700 watts: 1 minute 50 seconds- 2 minutes.